A retirement party kit which comes with retirement balloons, confetti, banners with the words Happy Retirement, and balloon wall hangings. 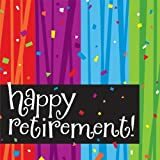 Your party is not complete without these fun, colorful "Happy Retirement!" Dinner Napkins. Each package contains sixteen 12in x 12in folded, 3-ply napkins. Includes: 2 balloon cluster picks, mini champagne bottle, mini golden cup, Congratulations script layon, and Happy Retirement plastic scene. Each package of Happy Retirement balloons includes 15 latex balloons. Each 12" balloon is printed with the words Happy Retirement and is surrounded by swirls and stars. Each package includes the following colors: red, yellow, green, blue and black.